BUENOS AIRES, Argentina — Once you’ve seen Buenos Aires’ wide, crowded boulevards and the balcony where Eva Peron waved to the masses, you might get the impression the city is all about grandiose architecture and the fast-paced attitude that is so common in big cities. But head to Palermo Soho, and you’ll notice that the buildings get smaller, the streets get calmer and the crowds get cooler. Once a rundown warehouse district with shabby stucco homes, the area takes its name from New York’s upscale SoHo neighborhood. 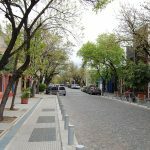 A canopy of oak trees lines the cobblestone streets, which are more pedestrian- and bike-friendly than in many other neighborhoods. Still be careful crossing the street because stop signs and crosswalks are but faint suggestions to most drivers. Palermo is Buenos Aires’ largest neighborhood, but it can vary greatly from one end to the other and it’s divided into several sections. 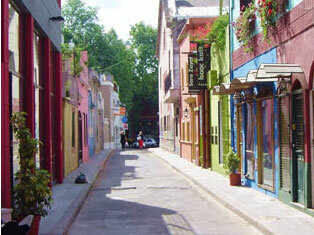 Palermo Soho is roughly bordered by the avenues Cordoba, Scalabrini Ortiz, Santa Fe and Juan B. Justo. From downtown, take the green D line on the subway, known as Subte, to the Plaza Italia station, find Jorge Luis Borges street and walk away from the botanical garden. After about eight blocks, you’ll run into the oval Plaza Serrano, which sits at the center of the neighborhood. Palermo Soho isn’t exactly undiscovered by tourists, but there aren’t many big hotels and it’s devoid of the city’s most famous historical and cultural attractions. Instead, you come to this part of town to shop, eat and drink. After the Argentine peso plummeted in value in 2002, importing clothes became prohibitively expensive. As a result, young local designers filled the void and opened up shop here. At Agostina Bianchi, located at Thames 1733, you’ll find limited edition, handmade clothing for women that seems to fuse knitting with high fashion. For men, try Felix, at Honduras 4916, for a wide selection of local brands in styles ranging from tank tops to suits. Gurruchaga street around the corner is packed with trendy boutiques, and during the weekends, Plaza Serrano and nearby Plaza Armenia transform into a funky arts and crafts fair. For dinner, Palermo Soho offers a high concentration of quality restaurants. The supper-clubby Casa Cruz, at Uriarte 1658, sits behind 15-foot brass doors and blends updated Argentine standards with Mediterranean flavors. The seafood-focused Crizia, at Gorriti 5143, provides a welcome break from all the beef joints in a soaring converted warehouse. Skip dessert and instead hit up one of the area’s numerous ice cream shops. Try dulce de leche, an Argentine specialty, at Tufic, at Guatemala 4597.